More than likely, pilgrims will already have received warnings and advice about this part of the journey between Lourenzá and Abadín, of 25 kilometres. It is true that this stretch is dominated by ascents. 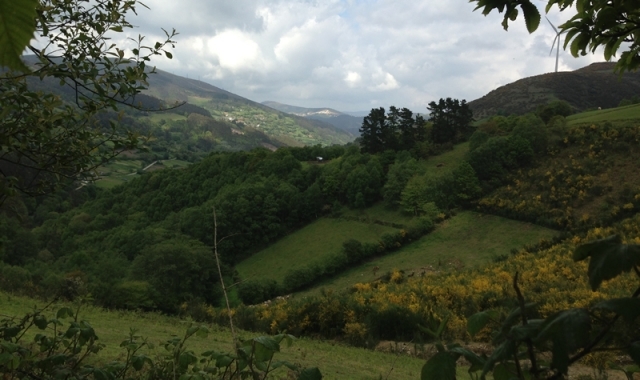 However, it is also compensated for by lush and solitary landscapes, through which pilgrims can walk peacefully, although they may have to keep a look out for foxes, wild boars, deer and squirrels, all of which are commonly encountered at the edge of the Camino. The day begins with a steep hill from the albergue of Lourenzá, but the main obstacle is reserved for the last kilometres, a gruelling ascent that runs parallel to the port of A Xesta. 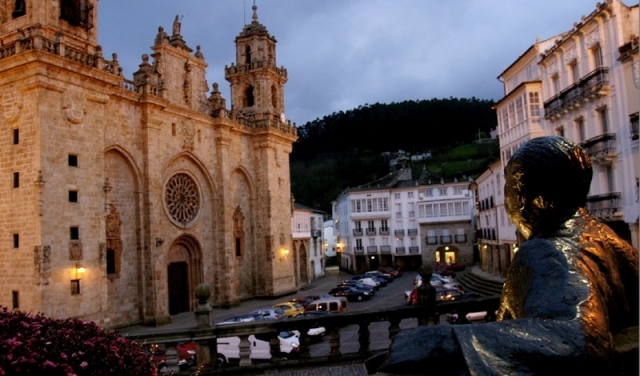 Travellers still have to complete a large part of the day, including a visit to the town of Mondoñedo, its cathedral and heritage makes it an obligatory place to visit. It is also a good place to stop for lunch, more over there are no other establishments until reaching Abadín, a location with basic services. The route departs from the public albergue of Lourenzá, next to the fountain and the tiny chapel of Nuestra Señora de Gracia, from the XVIII century. Just after beginning the hike, a few steps later, it takes a difficult narrow path, particularly uncomfortable for cyclists and as a result many choose to travel on the N-634 (Irún-Santiago) road instead until reaching Mondoñedo (8 kilometres away). Pilgrims then head towards Arroxo, in the neighbourhood of Grove (Mondoñedo), in which the will find a restaurant (a Voltina) and a sign for a nearby rural house (A Casa de Mañas). After reaching San Pedro da Torre and its chapel pilgrims arrive at a water fountain, on the left, and a stone statue that is well known in this area. Continuing on another difficult path for cyclists, although without inconveniences for walkers aside from the loose stones, the hamlet of Reguengo is reached, with a walnut tree providing shade over a water source. The route then passes below a granary and after passing San Paio the two towers of the cathedral of Mondoñedo come into view, situated just over two kilometres away. To visit Mondoñedo walkers have to go left until reaching the roundabout, in the same direction as the bus station. Once in the centre they should continue along the street Rúa Pardo de Cela, this will lead them directly to the foot of the majestic cathedral constructed in the XIII century. The centre of Mondoñedo is the ideal place to stop and eat or rest, especially given that there are 15 kilometres to walk in order to reach the town of Abadín, involving a hilly stretch lacking in services that will more than likely leave hikers feeling tired. From the cathedral the route continues to Fonte Vella via the street of Calle Rigueira, the road to San Caetano, Barbeitas, the hamlet of Maariz (13 kilometres from Abadín), with a great fountain situated at the foot of the Camino, equipped with a metal drinking jug. Accompanied by the Valiñadares River and the tiny houses of Paadín, Casabella and Pacio. Lousada, in the parish of Sasdónigas, situated some 7 kilometres from the end of the stage. At this point walkers have to climb all they descended and, a little more, the hardest climb of the day, ending in San Martiño de Galgao (Abadín). This is one of the areas with temporary diversions, however it is well sign posted. After going on the N-634 road walkers reach Gontán where they will find the public pilgrim albergue. This location has bars, a Tabaco shop, accommodation and a chemist. The centre is situated just one kilometre from the albergue and consequently this is the end of the stage. Many pilgrims choose to go on the N-634. This involves a stretch of 8 kilometres, with heavy traffic and for this reason recommendations are to take extra care. The remainder of the stage is on local roads and earthy paths, easy and practical on two wheels. 1 reviews Distance to Santiago: 167 km. 1 reviews Distance to Santiago: 160 km. 1 reviews Distance to Santiago: 141 km.